There has been a lot of buzz circulating the cigar community lately about this new brand hitting the street. Although I have heard tons of good things about 13th Floor Cigars, I haven’t had the opportunity to try one out for myself. That is, until just a few weeks ago when the brand’s owner Bryan White was nice enough to shoot a few over my way. “Established in 2009, 13th Floor Cigars was created to bring a new and innovative brand to market while delivering a premium Cuban style smoke. Our cigars are hand crafted in the heart of Miami’s Little Havana by some of the most experienced rollers in the industry. 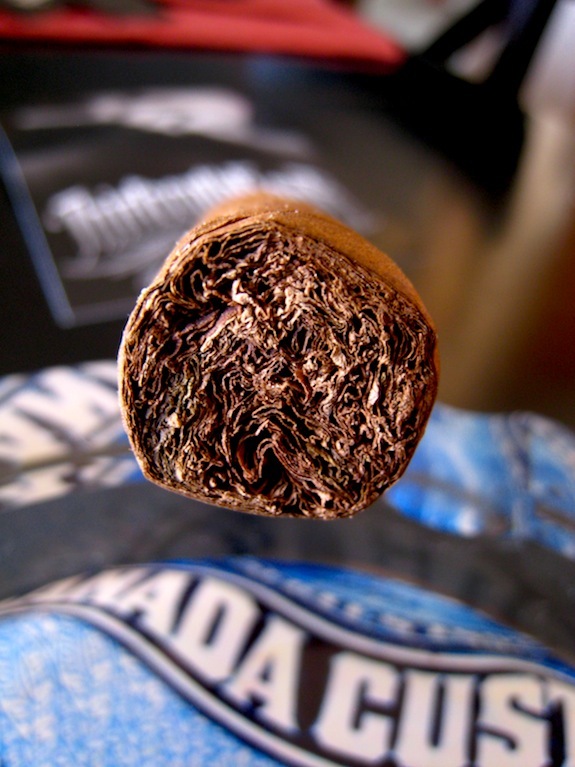 We use only the finest tobacco and our cigars are carefully inspected to ensure quality and consistency. Our first line, Foundation, has been met with rave reviews from the most experienced aficionados to those who enjoy an occasional cigar. We are hard at work bringing 13th Floor to fine tobacconists, cigar lounges and clubs nationwide. Why 13th Floor? What is the meaning behind the name? 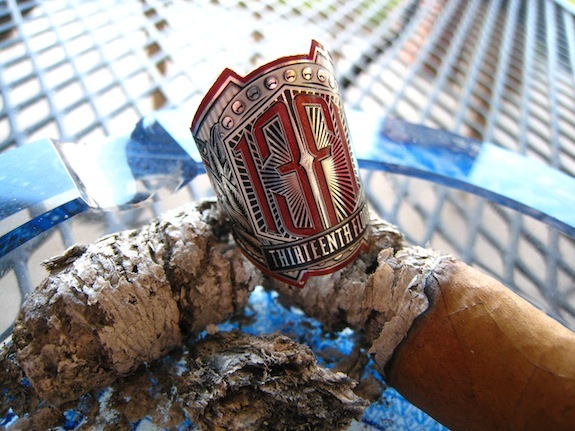 Prelight: The Thirteenth Floor cigar is a wonderfully constructed, consistently light brown complected cigar. 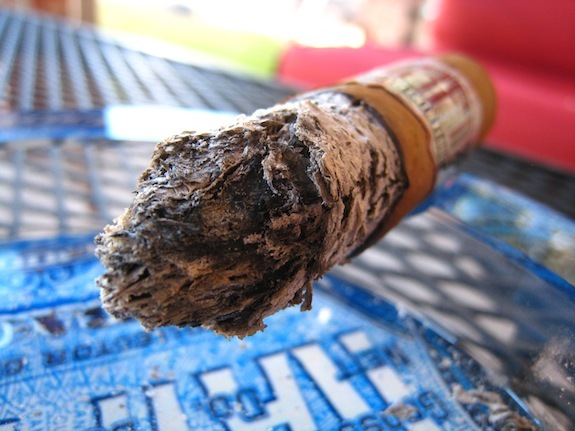 There are only a few spots of a darker brown color near the foot of the cigar. Ecuadorian wrapped cigars always scare me a bit due to their delicate nature, but this cigar is pretty sturdy and tough. 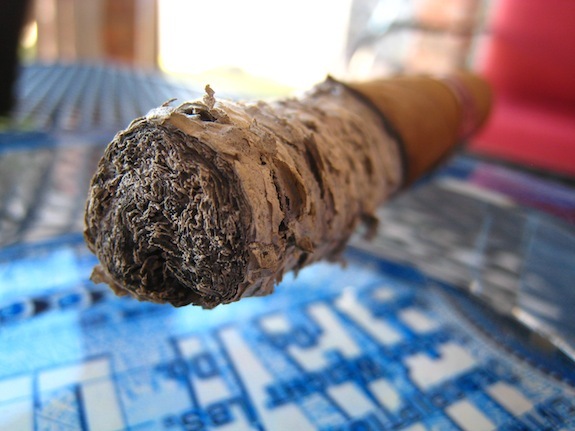 The cigar is tightly packed and give a nice little bounce when squeezed. 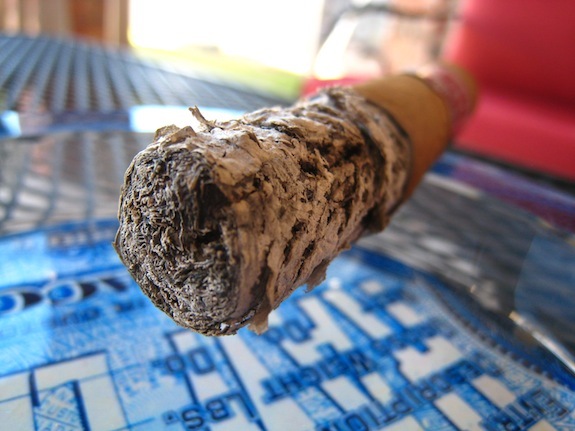 There are no soft spots, and only one larger vein running the course of the cigar’s silky body. The Thirteenth Floor Foundation is then topped off with a beautiful, rounded triple cap. The biggest stand out item n this cigar has to be it’s band. I am a huge fan of all Thirteenth Floor’s more untraditional marketing and the band pairs in well. The Band is chrome and accented red with bit of black. The Thirteenth Floor crest is embedded in an almost 3D bed of leaves, accented by two small shields with two white keys on them. I’m assuming these keys are then ones mentioned in the story about the brand. The wrapper gives off a very light cedar and spice aroma and a more pronounced cedar and tobacco scent with a bit of spice from the foot of the cigar. The Thirteenth Floor Foundation cut clean using m double bladed Palio Cutter. 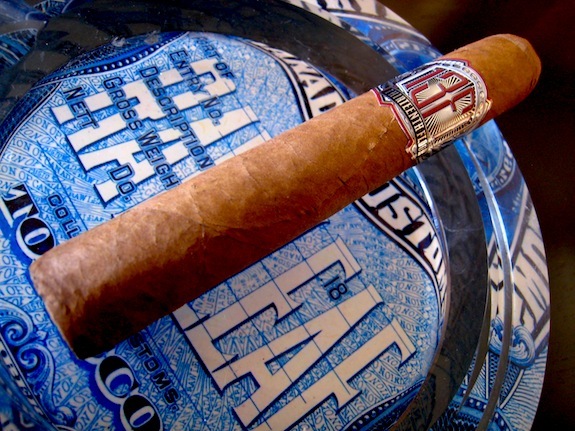 The cold draw emitted by this cigar gives off a very light, creamy ginger flavor with hints of tobacco and other spices. First Smoke: The Thirteenth Floor Foundation lit up with easy under my triple flame butane torch. The first flavors I was greeted with was a very creamy cedar flavor, matched up with soft spice and just a kick of pepper. The Thirteenth Floor Foundation produces an extremely effortless draw that produces a fair of amount of heavy, thick smoke. The burnline started off with one big wave that shot out like a race horse while the rest of the ash played catch up. After about an inch in the burnline corrected itself and started to burn dead even. The ash produced is a very bright grey and tightly packed with only a few flakes and held on just over two inches before giving way. Halfway There: Into the second third of this Thirteenth Floor Foundation I find it intriguing just how smooth this cigar is. I usually find myself only retro haling a few times each cigar, but I can’t stop doing it with this cigar. The retrohale is producing an amazing crisp cedar prime that really helps bring out the smooth flavors of the Foundation. The main flavors are a strong cedar, spice, and what I could best describe as a heavily creamed coffee. Burn line is perfect, and at this point I am feeling no nicotine kick at all. Finish: The last third definitely picked up a bit in body. Not enough to really feel much nicotine, but the ramp up was there. The creamy flavors began to take a back seat to the tobacco and spice flavors while the cedar still remained the main contender. The Thirteenth Floor Foundation Robusto only took me about an hour to smoke from start to finish. There was no harshness into the final end but the cigar did burn slightly hotter than I expected seeing how I really took my time to smoke this guy. Outside of the initial waves, the burnline stayed dead even the entire time and there was no need for any type of touch ups or relights. And the big, hefty looking band…Came off with ease. Gotta love that. Overview: Again I am really impressed with yet another lighter shade cigar. 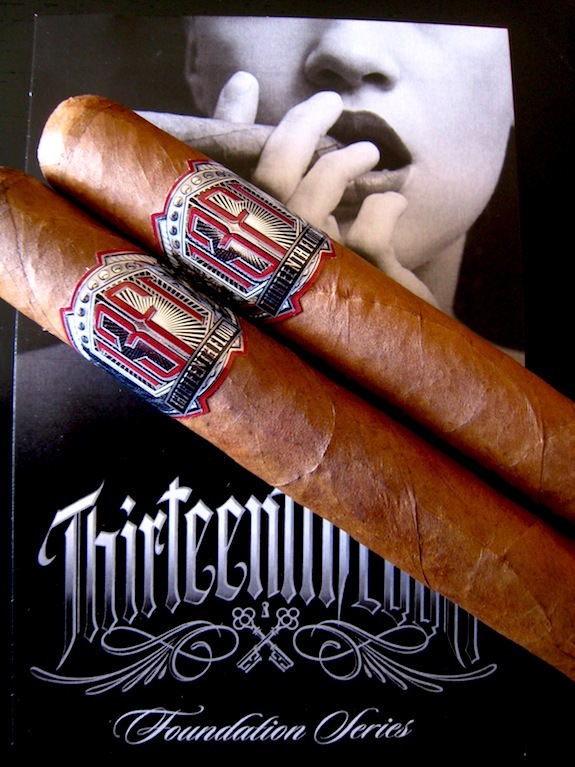 The Thirteenth Floor Foundation has just enough complexity to satisfy my needs, while the creamy experience and balanced flavors made for an enjoyable smoke. The best part about this cigar has to be the retrohale. Worst part? The cigar burned way too fast and kept me wanting more. This is an ideal cigar for any novice, or seasoned smoker. If you are interested in finding out more about Thirteenth Floor Cigars you can visit their site here, Facebook here, twitter here, or you can visit our sponsor Bonita Smoke Shop to place an order for a few of these bad boys. 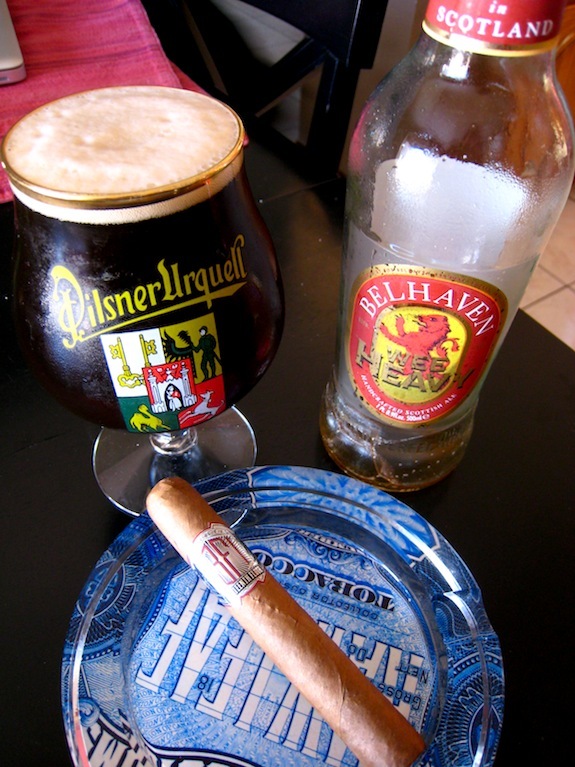 Pairing: I decided to go a little bold and pair this cigar with a favorite of mine, Belhaven’s Wee Heavy. I say I went a bit bold because the samples I smoke previous to this review were so rich and smooth I would normally pair it with coffee, tea, a nice tripel, or even a light Pilsner. Belhaven’s Wee Heavy is an in your face, spicy, fruity, woodsy Scottish Ale. And quite frankly, the decision worked out well. The fruits, malt, and spice were just enough to really pull the spicy tones from the creamy cedar of the cigar. Great review Tony on an awesome smoke! Great write up on a great cigar. You hit it right on the head. Love these cigars. Thanks again. Thanks Cliff! It was an excellent stick! 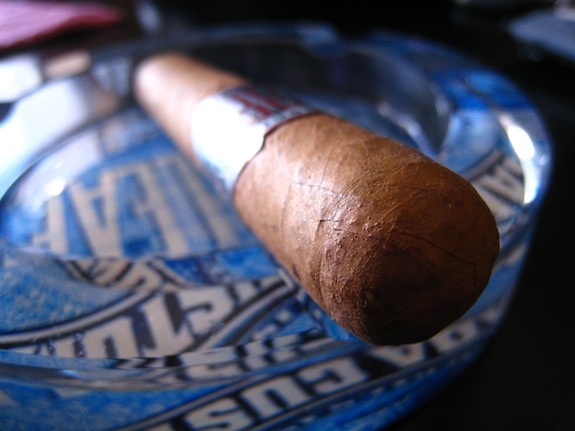 Awesome review…sounds like a cigar we need sold in DC! Good stuff Tony, sounds like a good smoke. Next time I’m down in Florida I will have to place an order with the good people over at Bonita. Great cigar and a great review. This cigar is one of my favorites and is so smooth, creamy and easy to smoke. I’m so glad that Bryan and this great cigar are getting the recognition they deserve. sounds like a good cigar, how do they rank in price? would this be an everyday smoke or a weekender? I’m also wondering if it is an everyday or a once in a while purchase. Albert And Agent. Sorry about that. I have no idea why I didn’t touch those subjects during the review. I spaced it. Great review as always Tony! Sounds like a tasty treat! You are correct, $8;/stick is a bit pricey to smoke them every day, but I wouldn’t have a problem putting something like that in my regular rotation..
A nice, well written review. Here’s another to add to my list. Thanks. I have yet to see these in my neck of the woods…. Thanks for the review. I’ve only smoked one 13th Floor, but I found it very enjoyable. Finally got my hands on a few of these thanks to a VERY generous Bryan White and I have to say I’m impressed. For such a young company in the cigar world these sticks are fantastic! Tony’s review was spot on! Well done Bryan!